The Victorians were a new breed of people, people with engineering skills to almost match their vision. Although very mechanical compared to world of microchips and mini gadgets, things were built to last. Here, I present some background information for a game or mod based around the engineering skills and imagination of the Victorian era. I have tried to include as much relevant information as possible but there is a list of resources, often duplicated within the text, at the end of the post. 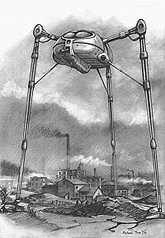 I make reference to H. G. Wells’ book War of the Worlds but I am not suggesting a game or mod based on this, in fact there is already a Half Life 2 mod in production. In 1880 the British and French started work on a Channel Tunnel. 3 Years later, after some technical success, the British pulled out citing flooding and fear of French invasion. In fact the truth is that the British had found a huge underground cave and did not want to share the discovery with anybody. In 1885 after 2 years of lying derelict, under the guise of make the surrounding area safe, the British Army continued digging to enlarge the access tunnels into the cave. They continued for another 53 years building a giant framework to ensure the cave would not collapse, setting up a complete underground steel and steam city. Then in October 1938 something very strange happened, the on-duty radio operator turn on his radio and heard that the Martians had landed. Senior Officers conferred before General Wilthrup came the order to “Seal the Cave!” Although they lalter heard it was just a radio play the General and his staff believed it to be a ruse by the Martians to instil a false sense of hope and security. At this point I’m not currently clear on how the draft story becomes a game. My initial thoughts were that you were some kind of civil servant looking through some old requisitions records and found details of the project, being a curious type you decide to don you Indiana Jones apparel and take a look. You manage to find an entrance but it is clearly only designed for one thing: getting in! Once inside you find that total seclusion has caused the citizens to become strange and fearful. Your entrance causes panic and you are hunted down like a dangerous animal. Your only hope is to find a way through the city and find an exit. Perhaps the underground city has become separated into two factions, one wanting to burrow deeper underground and the other wanting to make peace with the Martians. I’ve always been interested with the Victorian era; they built and designed such interesting buildings and machines. As a teenager I would attend weekend steam fairs where people would bring traction engines and other pre-world war two items. I even took my Vincent Comet motorbike (How I wish I hadn’t sold that baby!) to most of the shows. Perhaps this just nurtured my feelings of admiration for thoughtful design, this coupled with a love of huge buildings and you have an almost instant liking for Victoriana. My line of thought went something like this: What would have happened if the Victorians had been able to develop without the influences of the world around them. With only limited resources available and the fear of Martian invasion they may have developed weapons and defence systems designed to protect the city (Cities?) and its inhabitants. 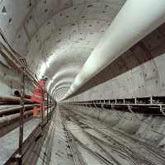 You may know that the Channel Tunnel was started at least twice before the current tunnel was completed (1994). I decided to use one of the previous attempts as an excuse for a large underground engineering project. The original tunnels are still there but are no longer accessible. There’s some interesting history behind the previous attempts and those interested should refer to the resources at the end of the post. Originally a book by H. G. Wells but Orson Welles had Howard Koch rewrite the story several times until he was happy with a radio play version. This version was broadcast on the radio on 30th October 1938 at 8:00pm in America. It caused panic because people actually believed that Martians had landed. Part of the play is an interview with a Professor, this interview sounds real. You may laugh but the style of the show was so realistic that the show’s producers had to pause it a number of times and inform listeners that it was just a play and not a news broadcast. Unfortunately many didn’t listen long enough. During the interview the Professor is handed a note saying that a large meteor has landed on a farm nearby. Carl Phillips continued to describe what he saw. Then, the invaders took out a weapon. “A humped shape is rising out of the pit. I can make out a small beam of light against a mirror. What’s that? There’s a jet of flame springing from the mirror, and it leaps right at the advancing men. It strikes them head on! Good Lord, they’re turning into flame! The audience is stunned by this news. But the situation soon gets worse. They are told that the state militia is mobilizing, with seven thousand men, and surrounding the metal object. They, too, are soon obliterated by the “heat ray.” The “Secretary of the Interior,” who sounds like President Franklin Roosevelt (purposely), addresses the nation. The radio reports that the U.S. Army is engaged. The announcer declared that New York City is being evacuated. The program continues, but many radio listeners are already panicked. 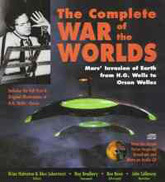 For more information about War of the Worlds and the radio show, including a downloadable mp3 version, see the resources at the end of the post. The image says it all! Don’t limit yourself to imagining a gloomy, corridor type place, but think BIG, the Victorians did! Everything except aeroplanes would probably be available; they maybe even developed superior submarine technology and have underwater farms etc. Perhaps some weird combination of airship and submarine could be used. 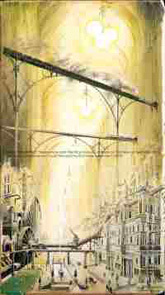 The setting would in no way limit the level design, in fact by focusing the mind we may get even more inventive levels. For me, one of the most amazing things produced by the Victorians is the Orrery, a mechanical device that illustrates the relative positions and motions of the planets and moons in the solar system in heliocentric model. Imagine what other types of mechanical devices they may have made that could be used within a game. This is probably the area that could receive the most attention. I’m tired of rocket launchers and lightning guns, I want something mechanical; iron, wood, steam and glass could combine to make great weapons. Here are a few ideas off the top of my head; spinning glass discs that shatter on impact or mini glass cannon balls filled with super heated steam that also shatter on impact, causing burns to victims. Over on BeyondUnreal Kangus started a thread in November 2003 about almost exactly the same idea, you can read the weapon ideas for yourself: Kangus’ thread. There have been two recent movies that have both touched on the theme, Van Helsing and The League of Extraordinary Gentlemen. Both movies demonstrate that there is life in this genre and with careful work a game could be produced. But perhaps Kangus was right and this game needs to be a horror game. Maybe then enough players would be attracted to it. I personally believe it to be an interesting theme and wish I could draw well enough to flesh out the weapons section. I’d be very interested to hear your thoughts. How about someone doing a mod for the “Rendezvous with Rama” series! I know they tried making a movie from it a while back but it went bust. Offical website for movie Mention a video game. Joe Miale Look under short films, I’m downloading it as I type.